If the transmission position display in the multifunction display is not working, you should pull away carefully to check whether the desired transmission position is engaged. Ideally, you should select transmission position D and, in AMG vehicles, drive program C or S. Do not restrict the shift range. The current transmission position and drive program appear in the multifunction display. 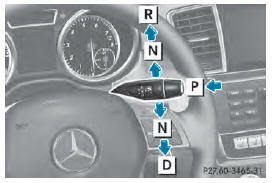 ■ Push the DIRECT SELECT lever in the direction of arrow P.
Park position P is automatically engaged if: R you switch off the engine using the SmartKey and remove the SmartKey. • you switch off the engine using the Start/ Stop button and open one of the front doors. • the HOLD or DISTRONIC PLUS function brake your vehicle until it is stationary and at least one of the following conditions is fulfilled: - there is a system malfunction. - the vehicle is on a steep uphill or downhill gradient. The electric parking brake is then also applied. ■ When the vehicle is stationary, depress the brake pedal. ■ Push the DIRECT SELECT lever up past the first point of resistance. ■ Push the DIRECT SELECT lever up or down to the first point of resistance. If the engine has been switched off, the automatic transmission automatically shifts to N.
R Make sure that the ignition is switched on. R When the vehicle is stationary, depress the brake pedal and keep it depressed. R Shift to neutral N.
R Release the brake pedal. R If the electric parking brake is engaged, release it. R Switch off the ignition and leave the SmartKey in the ignition lock. • Make sure that the ignition is switched on. 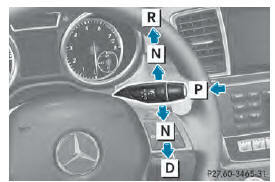 R Engage park position P.
R Remove the Start/Stop button from the ignition lock. R Insert the SmartKey into the ignition lock. R Switch on the ignition. R Depress the brake pedal and keep it depressed. ■ Push the DIRECT SELECT lever down past the first point of resistance.